Item #E168121 - Floral Art Glass African Amethyst Colored Crystal Antique Brass Vintage Chandelier Dangle Pierced Earrings. Size: Length: 3" x Width: 1 1/2" at the widest point. Are these just absolutely divine! 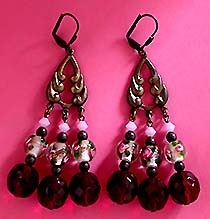 The alluring dangles are graduating drops done in pink crystals, antique brass beads, breathtakingly beautiful art glass balls inlaid with pink roses and green leaves, and heavily faceted purplish red glittering crystals. Each faceted gleaming crystal measures 1/2"! Drop dead gorgeous! For pierced ears. Excellent Condition. Fabulous earrings for weddings, proms, parties and special functions! US$188.00. SOLD. Item #E168162 - Weiss Clear Crystal Rhinestone Silver Tone Vintage Clip Earrings. Size: 1 1/2" x 1 3/8". Designer: Marked WEISS on all three pieces. Albert Weiss is one of the world renowned designers of the 40's and 50's known for the top quality of his costume jewelry, on the par with Eisenberg, Boucher and other great designers of that era. Be dazzled! These splendid Weiss earrings are to die for. I can't begin to tell you how much they sparkle. The unique kite cut stones are multi-faceted throwing off an abundance of brilliant sparkles. And look at the one-of-a-kind breathtaking floral-like design, 3 layers of sumptous stones hugging each other creating wonderful thickness and dimension. Each dazzling sizable crystal rhinestone measuring 1/2" x 1/2" is individually pront set into tall shining silvertone metal. Just absolutely magnificent! Clip backs. Excellent Condition. Fabulous earrings for weddings, proms, parties and special functions! US$188.00. SOLD. 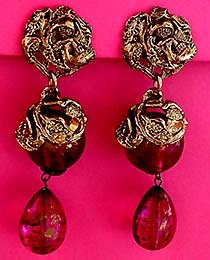 Item #E168161 - Purplish Red Murano Glass Antique Goldtone Vintage Dangle Clip Earrings. Flaw: The clip backs have been replaced (not the original clip backs). This does not affect the functionality of the clip or the appearance of the earrings. These painfully beautiful earrings are simply irresistible! The middle is a large reflective Murano glass ball adorned by a thick ornate antique goldtone cap. The ear piece and the cap are deeply carved with leave and vine motif. The large Murano glass drop sways flirtatiously inviting another lingering glance. The Murano glass ball measures 1" in diameter and the teardrop measures 1" x 3/4". Wow! Clip backs. Excellent Condition. Fabulous earrings for weddings, proms, parties and special functions! US$168.00. SOLD. 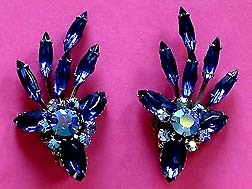 Item #E168167 - Juliana Style Sapphire Blue Aurora Borealis Crystal Rhinestone Silvertone Vintage Clip Earrings. Size: 2" x 1 1/4". Exquisite, slender sapphire blue sparkling crystal navette cut rhinestones sprouting femininely upwards. The bottom is a star design of 3 large glittering marquises and a reflective Aurora Borealis blue rhinestoned floret. The navettes measure 1/2" each. The marquises are 1/2" x 1/4". The rhinestoned floret measures 3/4". Truly breathtaking! Clip backs. Excellent Condition. Fabulous earrings for weddings, proms, parties and special functions! US$78.00. SOLD. 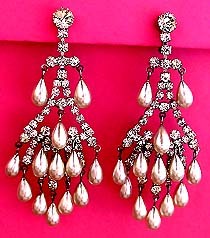 Item #E168125 - Large Clear Crystal Rhinestone Silvertone Vintage Chandelier Dangle Clip Earrings. Size: Length: 3 3/4". Width: 1 1/2" at the widest point. Need I say more, WOW! My heart skip a bit everytime I look at these dramatically beautiful earrings. Gorgeous danling teardrop lustrous faux pearls sway enticingly at the slightest toss of the head and the unbelievably beautiful dangles throw off an array of brilliant sparkles. The magnicient chandelier design of the clear crystal rhinestones and luxurious faux pearls resembles a peacock feather. Absolutely out of this world! Clip backs. Excellent condition. Fabulous earrings for weddings, proms, parties and special functions! US$188.00. SOLD. 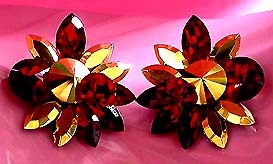 Item #E168172 - Ruby Red And Gold Crystal Rhinestone Vintage Clip Earrings. Size: Length: 1 5/8" x 1 3/4". Spectacular! I love the gorgeous colors of ruby red and gold! The dazzling vibrant marquise crystal rhinestones add a rich, luxurious feel to the piece. They throw off so much glitters it is mesmerising. You can't help but being drawn into the depth of the stones! The large round stones measure 5/8" in diameter. The large marquises measure 5/8" x 3/8". Acutely beautiful! Clip backs. Excellent condition. Fabulous earrings for weddings, proms, parties and special functions! US$68.00. SOLD. 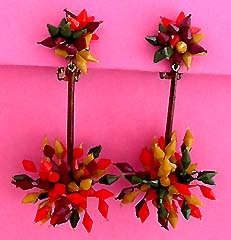 Item #E168165 - Multicolor Old Plastic Starburst Vintage Dangle Clip Earrings. Size: Length: 3". Width: 1 1/2" at the widest point. How cool is that! A cluster of eye-catching, colorful diamond-shape molded old plastic forming a starburst designed fuzz ball at the top and bottom. The top spiky ball measures 3/4". The bottom ball measures 1 1/2". The stem in the middle is metal encased in a brown plastic tube so that the entire dangle swing in unison. Wild! Clip backs. Excellent condition. Fabulous earrings for weddings, proms, parties and special functions! US$68.00. SOLD. 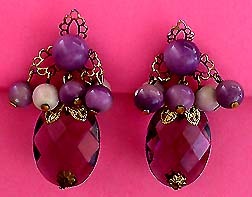 Item #E168169 - Purple White Bead Amethyst Crystal Glass Stone Gold Tone Vintage Dangle Drop Earrings. Size: Length: 2" x 3/4". I just love the design of these gorgeous earrings. They have an intense antique feel to them. The center of the ear piece is a round, glossy purple glass bead craddled by three filigree goldtone petals and has 5 smaller purple and white glossy glass beads hanging from it. Dangling from this gorgeous arrangement is a large oval, faceted, glittering amethyst colored glass stone embellished by goldtone filigree caps. How sweet! The large round bead measures 3/8" in diameter. The large oval stone measures 1 1/8" x 3/". Absolutely beautiful. Clip backs. Excellent Condition. Fabulous to wear at weddings, prom nights, pageants, parties, cruises and special functions! US$78.00. SOLD. 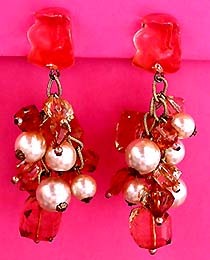 Item #E168265 - Faux Pearl Coral Bead Goldtone Vintage Button Clip Earrings. The center lustrous peach coral bead has a baroque surface and is made of hard vintage plastic. It is surrounded by luxuriant smooth white faux pearls, all mounted into a thick goldtone florentined finish setting. Very lovely! Clip backs. Excellent Condition. Fabulous earrings for weddings, proms, parties and special functions! US$48.00. SOLD. 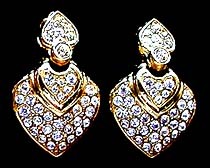 Item #E168157 - Sweet Heart Clear Crystal Rhinestone Goldtone Dangle Clip Vintage Estate Antique Earrings. These gorgeous earrings are a perfect gift for your sweetheart. The design says it all. The ear piece is a heart design and the dangle piece is heart shaped and further accentuated by another heart design atop. The entire earrings are encrusted with sparkling clear crystal rhinestones. The edges are high-polished bright goldtone. Truly elegant, high-end and high-quality. Clip backs. Excellent condition. Fabulous earrings for weddings, proms, parties and special functions! US$78.00. SOLD. Item #E168168 - Champagne Colored Lucite Stone Faux Pearl Vintage Clip Earrings. Size: Length: 3 1/2". Width: 1 1/8". These fantastic Dangle Drop Earrings are so much fun! The ear piece is a large irregularly shaped lucite stone (7/8" x 3/4" X 3/4") very much like glass. Then a galore of large lustrous faux pearls and large square and diamond shaped, faceted, glittering lucite crystal-look stones (3/4" X 5/8") dangling from the ear piece. Each lucite crystal-look stone has a small glass bead wired to it. The dangles make delightful clattering sounds when moved. Absolutely delightful, bold and lots of look! Clip backs. Excellent Condition. Fabulous earrings for weddings, proms, parties and special functions! US$48.00. SOLD. 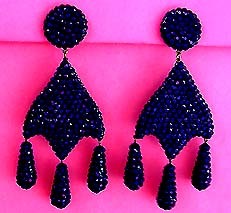 Item #E168163 - Barbara Groeger Sapphire Blue Crystal Rhinestone Vintage Dangle Clip Earrings. Size: Length: 4 1/2". Width: 1 34" at the widest point. Remarkably beautiful, bold, showy and not for the timid! The entire earrings are studded with glitzy sapphire blue crystal rhinestones, even the back of the earrings are covered with rhinestones so they look fantastic front or back. They swing a lot throwing off a tremendous amount of glitters. What a beauty! Excellent Condition. Fabulous earrings for weddings, proms, parties and special functions! US$128.00. SOLD. Item #E168208 - Saks Fifth Avenue White Faux Pearl Rhinestone Dangle Drop Earrings For Pierced Ears. Size: Length: 2 1/2" x Width: 1 1/2". 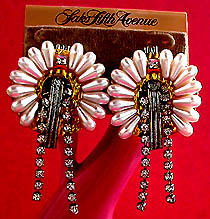 Designer: Earrings come in a Saks Fifth Avenue display card. The focal point of these gorgeous Saks Fifth Avenue Dangle Drop Earrings are the glorious lustrous white elongated faux pearls. They are mounted on a goldtone circular plate tilting slightly upwards. The two strands of glittering clear rhinestones are separated by a ribbing style arching silvertone band with one strand purposely done a little shorter than the other. What a beautiful designer stylish piece! Excellent Condition. Fabulous earrings for weddings, proms, parties and special functions! US$88.00. SOLD. 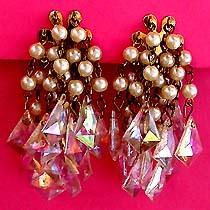 Item #E168166 - Faux Pearl Lucite Prism Vintage Dangle Clip Earrings. Strands and strands of lustrous faux pearls and glittering lucite prisms of various lengths, overlapping with volume, swing and shimmer at the slightest movement. Each lucite prism measures 3/4" x 1/2". The lucite prisms are Aurora Borealis coated glittering with flashes of diamond shines. Very pretty indeed. Excellent Condition. Fabulous earrings for weddings, proms, parties and special functions! US$48.00. SOLD.